Given the current state of the employment-to-population ratio, we would predict that the current labor-force participation rate would be 1.5% points below its natural rate. That gives us a predicted labor-force participation rate today of 64.3%-64.7%. Instead, our labor-force participation rate is 63.6%. That is a gap of 0.7%-1.1% points of the adult population: people who really ought to be in the labor force right now, but who are not. Evan Soltas breaks down the numbers of the decline according to various factors, including gender. And as many people, for instance Mark J. Perry, have noted, the decline in the labour force participation rate is partly due to the fact that men are leaving the labour market. 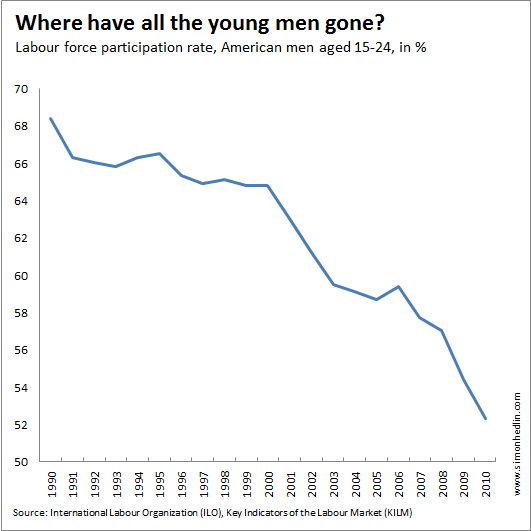 The main reason the labor force has been declining in the last couple of decades, then, is that men have been dropping out in droves. 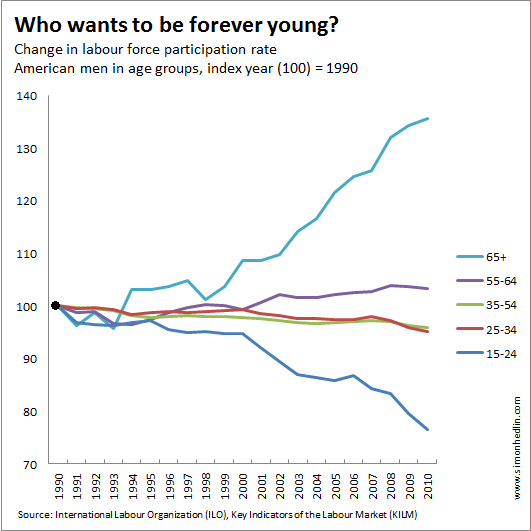 Rampell has posted two interesting graphs, where the first shows the labour force participation rate among adults aged 25-54, and the second shows the long-term trend of men aged 25-54 leaving the labour market. This chart shows foremost two things: 1) the labour force participation rate varies widely between the age groups, and 2) the only age group for which we find a large decline is men aged 15-24. So for two age groups, the labour force participation rates among men have actually increased over time, for two other groups they have – in relative terms – decreased a little, and for the youngest men it has declined severely compared with 1990. Here it is also interesting to note the clear positive relationship between age and change in labour force participation rate. This entry was posted in Allmänt and tagged Brad DeLong, Catherine Rampell, demographics, demography, labour force, labour-force participation rate, Mike Konczal, Pete Seeger. Bookmark the permalink. Oh Brother, were aret Thou? Consider how the country treats and is bias against it’s male population and it’s really no surprise. It’s about time. I left because I felt the country was so much against males. Off to a land were I’m not judged so much by my gender and compete on equal ground with women. phone system 2 locations other at no expense to either party. Business phone phone system 2 locations systems are bought in the next six months at least. Integrating numerous telephones at various spots into a single network. modern business offices are equipped with several features.